The United States government had grown wary after the Mexican Revolution began in 1910, and relations had tensed as each side accused the other of banditry and incursions. The United States set up a military camp in Nogales, Ariz., and General John J. Pershing was dispatched to chase after Mexican revolutionary leader Pancho Villa. The Sonora governor put up an 11-wire fence, which got torn down four months later. In 1918, after the two cities went to war for a day because an American guard shot a Mexican citizen at the border crossing, authorities on both sides agreed to construct a permanent chain-link fence between them. But as life resumed, the fence became a technicality, not a reflection of how people related across the line. During Prohibition, Mexicans built saloons that straddled the border, so that patrons could drink so long as they were on the correct side of the building. Ms. Maitrejean remembers how this tight-knit existence endured as she was growing up. In the 1950s, a Mexican shop on International Street would put up a huge blackboard to transmit the World Series as nogalenses watched the games excitedly from the United States side. On Cinco de Mayo, city leaders would build a platform over the fence and crowned a binational queen as a joint parade marched across the border. Paul Bond Boots in Nogales, Ariz.
Made of 10-foot panels of corrugated steel that the United States Army had used to land helicopters in the Vietnam War, that was the fence that locals most resented, for it blocked the view they had always had to the other side. Then in 2011, the federal government replaced it with a rust-colored steel bollard fence, encased in cement footing with four-inch slats between the bars. Now, the two Nogaleses could see each other again, somewhat. Soon, families that didn’t have the right paperwork to cross started coming to either side on weekends to catch up with each other across the bollards. A church in Nogales, Sonora. Driving south the 60 miles from Tucson, where the closest commercial airport is, the highway rises thousands of feet as the desert scrublands of the lower Sonoran desert give way to hilly terrain ringed by the Santa Rita, San Cayetano and Tumacacori mountains. The region nurtures some of the best bird-watching in North America and an abundance of wildlife, such as javelinas, rattlesnakes and hawks. There are many activities in the region that can be paired with a visit to the two Nogaleses, including hunting for deer and mountain lion; fishing at Peña Blanca Lake; wine tasting and hiking in Patagonia and Sonoita; and golfing in Tubac, Kino Springs or Rio Rico. A worthwhile stop is the artists’ colony of Tubac, where you can learn about the Spaniards who first explored the region at the Tubac Presidio State Historic Park and nearby Tumacacori National Historical Park, as well as hike or ride a horse along the same trail that Juan Bautista de Anza traveled by foot with 240 women, men and children on his 1,200-mile journey to establish the first nonindigenous settlement at San Francisco Bay. But in my view, as a lifelong student of the border, the cultural treasure is Nogales itself. Here, the kind of tourism you’re doing changes, and you train your eye and ear to catch things you wouldn’t see or hear in other parts of the country. In Nogales, I heard perfectly bilingual speakers mix Spanish and English more as an artful form of expression than a linguistic deficiency (“le pide a la señorita que nos traiga un sautéed spinach?”). The Mexican side of the border wall in Nogales, Sonora. Almost everything is bilingual and international. Twice, I assumed that individuals with fair skin and Anglo last names were white, only to learn they had at least one Mexican parent. I met Mexicans who had dual citizenship and owned homes on both sides of the border, and white residents who spoke excellent Spanish. The Paul Bond Boots shop that has made the traditional custom boots of classic Western films is staffed by Mexican craftsmen. Economically, Nogales today still thrives on international commerce. It depends on the logistics and transportation services industry that supports maquiladoras in Sonora and on the import of produce, which makes up half of the Mexican vegetables and fruits consumed by Americans. Shops in downtown Nogales, Ariz. It also relies heavily on Mexican consumers — Nogales, Sonora, has 450,000 residents to its 20,000 — and those shoppers are coming over less and less. Mr. Urman said annual pedestrian crossings into Nogales, Ariz., have dropped to 2.7 million from 7.7 million in the past 10 years. John Doyle, the mayor, said various factors have led to the decline, including the devaluation of the Mexican peso and increased wait times at the ports of entry because of heightened border security. Still, he said, President Donald Trump’s talk of building a longer and heavier border wall is of less concern to him and the mayor of Nogales, Sonora, than his roiling against international trade. On the other side of the dividing line, the steel fence gives way to a protest of walls and borders. The government has permitted some local artists to put up creative works that make bold statements, while others have informally drawn on it with spray paint. One piece, titled “Paseo de Humanidad” (“Parade of Humanity”), features a procession of extraterrestrial-looking steel figurines marching toward the border with emblems on their bodies that evoke the economies that drive people to migrate (one figure is made of maize, and another bears an “Hecho en Mexico” stamp, possibly alluding to the maquiladora plants that displace people from their home regions). Another installation consists of 60 small wooden crosses that lean against the fence, each one symbolizing a migrant who has died crossing the border. One painting, which makes a haunting image at night when the streetlights reflect the wall’s bars onto the street below it, simply shows the boyish face of a teenage boy. It memorializes Jose Antonio Elena Rodriguez, a 16-year-old who authorities say in 2012 was throwing rocks to distract Border Patrol agents as two males tried to drop back down to the Mexican side of fence after smuggling bundles of marijuana. One of the agents shot through the fence and killed the young man on Mexican land. The border and its themes naturally infuse some of the artistic production of Nogales, Sonora, because of the way it shapes the artists’ daily lives, said Elena Vega, a local poet and photographer who also experiments through painting, dance, music and spoken word. El Pescadito in Nogales, Sonora, a stop on a gastronomic tour organized by the Border Community Alliance. Even as downtown Nogales, Sonora, also struggles to remain vibrant with fewer Americans crossing over, the rest of the city is thriving, seemingly growing by the day and producing not just art, but a new gastronomic culture, said Alex La Pierre, the program director for the Border Community Alliance. 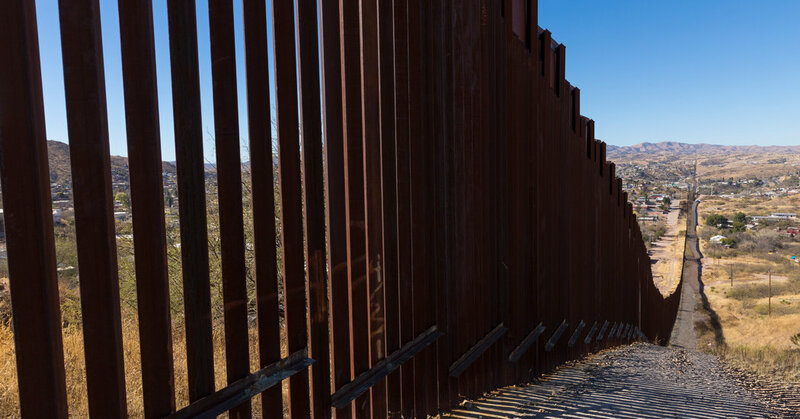 The alliance, which works with organizations in both countries to increase social investment and improve Americans’ understanding of the border, offers tours for Americans who prefer to visit with a guide. One of the tours introduces them to nonprofits including a migrant shelter. Another takes them to a craft brewery and to Calle Hermosillo, a long street that is home to many new restaurants and bars. On a warm Saturday in early January, as I walked the downtown zone, averting my eyes to avoid the many vendors who will immediately try to pull you into their curio shops, I felt the energy change immediately. Mexican border cities are always a little busier and more alive than their American counterparts. Cars backed out of parking spots from every direction, and people moved briskly along the sidewalks. Amid endless pharmacies and dental offices catering to mostly-gone Americans, local life pulsed and thrived. As I turned a corner and made my way toward Calle Internacional, the street that once singularly marked the border, to view the wall art, I glimpsed a young woman on the American side of the fence who was reaching through it as she lovingly stroked the head of a teenage boy squatting on the other side. And I remembered Jessy Zamorano’s comment about tourists reacting when they witness these displays of humanity. It seems something fantastic happens when you draw a line on the ground: people almost instinctively reach out across it toward each other. And that’s a hard thing to appreciate from anywhere else but the border.